This is a great light and nutty pancake. 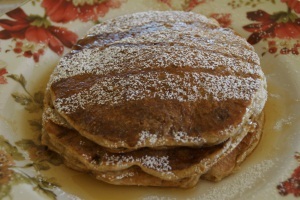 The almond and wheat combination create a mildly sweet pancake with an almond kick! Mix the flours, cornmeal, brown sugar, baking powder, baking soda, and salt in a large bowl and set aside. Whisk milk, yogurt, egg, vanilla and almond extracts in an electric mixer or whisk by hand in a separate medium sized bowl. Add dry ingredients and mix until just blended. Gently stir in the melted butter and slivered almonds. Heat large scan pan or nonstick skillet over medium heat and drop 1/3 cupfuls for each pancake onto the griddle, spacing apart. Cook pancakes until light brown on the bottom and bubbles form on top. Gently turn pancakes over and cook until bottoms are brown and pancakes are firm. Transfer to plates and serve with warm maple syrup. *Pancake batter can be prepared the night before. Stir in the almonds the morning of to prevent them from getting soggy. If entertaining cook pancakes last and keep in warm oven of 200 degrees before serving.